prepares to run around it's train at Rhymney on a sunny Saturday 19th March 2005. 37425 and 37411 were also in use this day. Central having arrived from Rhymney on 27th March 2004. In final post and summary of 2015 I mentioned how good it is to see some regular class 37 hauled trains returning to the national network both in Cumbria and Anglia. For many of the younger (but not too young) generation the last days of the 37/4's are associated with the North Wales Coast route. I myself was 'too late' to enjoy the 'tractors' on this scenic railway but did not miss out sampling these fine machines in South Wales on the Rhymney Valley line where the class maintained some work until 2006. 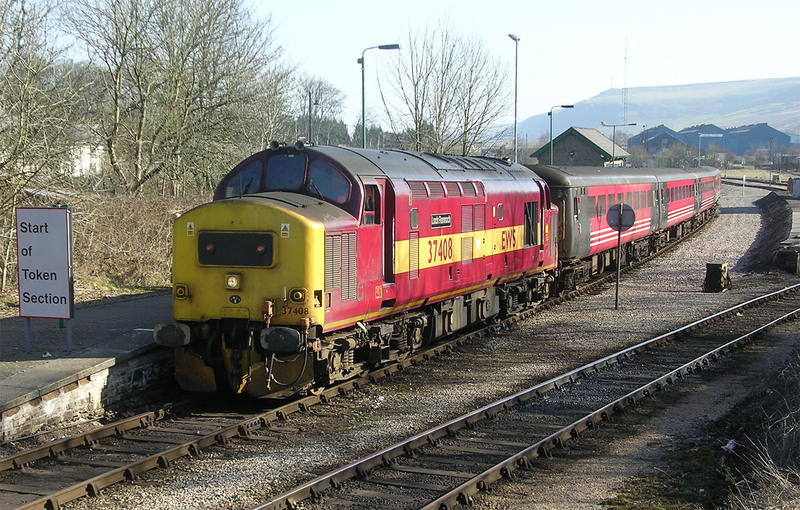 For several years three class 37/4's were required each day from Cardiff Canton to operate peak weekday commuter services; 3 trains from Rhymney to Cardiff Central (and Radyr) in the morning and return in the evening. Saturdays were were the fun really started with class 37's booked to work all trains from Cardiff to Rymney with an hourly departure in each direction. The line up the valley is steep in places and the regular stops meant the locos often put on a good show. Early in 2005 with the end of loco haulage on the line drawing nearer Arriva Trains Wales sponsored the re-painting of two class 37's to mark the event. 37411 was out-shopped from Toton in BR green as 'Caerphilly Castle/Castell Caerffily' while 37425 emerged in BR Large Logo blue as 'Pride of the Valleys/Balchder y Cymoedd'. Even more exceptionally when the curtain was finally coming down on the class 37's in South Wales a 'gala' event was organised on the Rhymney valley line on Sunday 4th December 2005 (the line not usually seeing a Sunday service) with additional locomotives drafted in enabling hourly trains to be top and tailed on the line. Locos in use represented the classes which had been used on the line over the years and were 33207, 37411, 37419, 37425, 47854, 50031 and 50049. Society' works the 17:01 Cardiff - Rymney on 21 October 2006. This should have been the end for class 37's in the Welsh valleys, but early in 2006, due to cited overcrowding one return trip was re-introduced Monday to Friday between Rhymney and Cardiff. There would be no return to the Saturday bonanzas and with far less ceremony the final class 37 to reach Rhymney was 37410 with the 17:01 Cardiff- Rhymney on Friday 8th December 2006. The train returned to Cardiff the following Monday and, for the final time, that was the end of class 37 hauled passenger trains in the South Wales valleys.